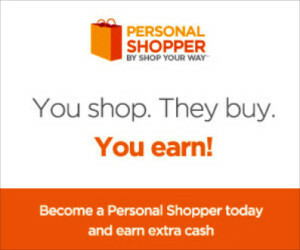 Shop Your Way Personal Shopper | A Savings WOW! Disclosure: This is a sponsored post. I am a Sears blogger, though all opinions are my own. We’ve been big fans of the Shop Your Way Rewards program for some time now. We use it when we shop at Sears, Kmart, Lands’ End, mygofer.com, and Sears Outlet. It’s helped us save money and earn rewards through our purchases. Our favorite part of the Shop Your Way Rewards program is when we’re surprised randomly with free points in our account, which means FREE shopping! Recently, I’ve become a Shop Your Way Concierge Personal Shopper. As a Shop Your Way Concierge Personal Shopper, I am able to do what I love, which is help others find what they need or want at a great price. I also love being able to help them earn rewards towards future purchases. Unlike some other rewards programs where you have to wait for a certain amount before you can redeem your points, you can continually redeem your points in the Shop Your Way program after they are earned, with no minimum amount needed. I’ve really enjoyed my role as a Shop Your Way Concierge Personal Shopper. The great news – they are looking for more personal shoppers! If you love sharing deals, helping people save money, and want to earn money while doing so, then this is for you! If you are interested in finding out more about becoming a Shop Your Way Concierge Personal Shopper, fill out this form. It is an invite-only program right now. We’d love to hear if you decided to sign up as Shop Your Way Concierge Personal Shopper! Leave a comment below. I think a personal shopper is a great idea!! I know that sometimes I just need help picking out things!